We provide effective training and best practices to increase & retain enrollment, and meet consumer health care needs. We create space & opportunities for membership support and community building. We advocate at the federal level - and support member advocacy at the state and local levels - on issues impacting assisters and consumers. We develop sustainable funding to properly support assisters and national enrollment (and post-enrollment) work. We demonstrate the value assisters provide by collecting and analyzing qualitative & quantitative research. 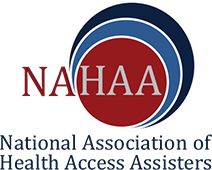 NAHAA is the newly formed National Association of Health Access Assisters (NAHAA), a project of California Coverage & Health Initiatives (CCHI). The National Association of Health Access Assisters supports and advocates for the Health Access Assister profession. Get the tools, training and education you need to make an impact as an Assister. The National Association of Health Access Assisters elevates, advances and advocates for the Health Access Assister profession. The goal is to promote and support the work of our members who help individuals, children and families gain, use, and retain high quality health care and coverage. Learn more about us.